Welcome to Ulysses-31.com, home of Ulysses and all other crew members of the Odyssey. 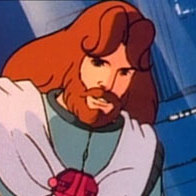 Ulysses 31 is a cartoon that was popular in the 1980s, a modern sci-fi telling of age old stories and packed with atmosphere. Originally created for a French audience by a Japanese studio, Ulysses was also dubbed into English and eventually aired around the world. Set in the futuristic 31st century, heroic Ulysses is captain of the spaceship Odyssey. When he angers the gods by destroying Cyclops and rescuing its prisoners, the Odyssey's crew are cursed and put into suspended animation. So the adventure begins, Ulysses and the remaining skeleton crew must find their way to the Kingdom of Hades to lift the curse. Learn all of the words to the Ulysses 31 theme song! 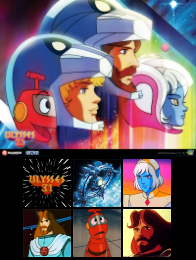 Get Wallpapers and Avatars based on the Ulysses 31 cartoon!